Social media on the intranet (Intranet 2.0) is present on about half of all intranets. Once a nice-to-have or future wish, Intranet 2.0 tools such as blogs, wikis and other vehicles have become mainstream. Despite the low cost of entry, most Intranet 2.0 tools are merely experiments, pilots or limited to a very small audience. Of the organizations that have adopted intranet 2.0, only 25% of them have done so enterprise-wide (see the results of Prescient’s Intranet 2.0 Global Survey Intranet 2.0 becomes mainstream). However, the outcry for social media is at an all-time high and continues to grow. Here at Prescient, we are continually requested to add web 2.0 functionality to organizations’ intranets. As well, we are seeing a lot of homegrown or one-off solutions bolted onto existing intranets. Many times this occurs because the overall intranet is not satisfying the needs of the employees. I have been compiling a list of over 70 specific web 2.0 tools on Prescient’s Intranet 2.0 Tools Matrix (a portion of it is illustrated below). Within the matrix, we have listed the Intranet 2.0 tools or software (Note: these tools are specific to the intranet—no Facebook, but a Facebook-like internal application such as Cubeless is listed). 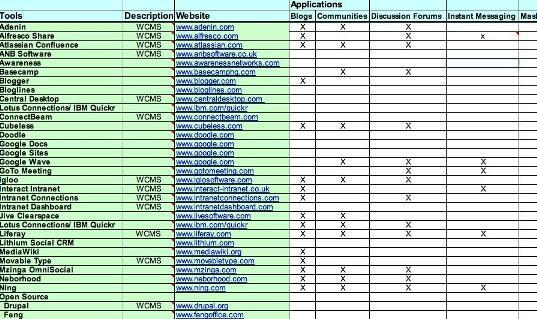 Along the top, we have listed web 2.0 applications such as blogs, wikis, podcasts, instant messaging, etc. Now the fun part—we have cross referenced each tool with each application. As in choosing a WCMS, one size—or in this case one tool—does not fit all. What is required is a strategy of what your organization is trying to accomplish. I have had numerous clients come to me and ask for a tool rather than a business solution. For example, I have had clients ask for a blog, not really knowing what it could do, when in fact all they really required was a simple discussion board or want ad page. Choosing the right strategy is the first and most important step. 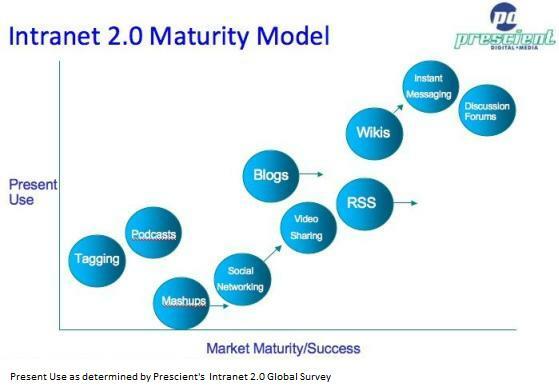 It’s no coincidence that there is a strong correlation between what Forrester is calling mature or successful applications and what Prescient has found in its annual Intranet 2.0 Global Survey Intranet 2.0 becomes mainstream. If we look at wikis, you can see that according to the Forrester Enterprise 2.0 Tech Radar chart, they are quite mature and will continue to grow. Correlating that with Prescient’s survey, we see that wikis are in fact, the third most popular Intranet 2.0 application. In fact, employee wikis were present in 45% of all organizations (regardless of size), but only 17% of organizations had deployed them enterprise wide. We also see that social networking, although very popular outside the enterprise, is still not mature or popular within the enterprise. However, we see that social networking will gain in maturity and we also anticipate it being more popular in this year’s survey. As well, we are seeing many new entrants in the market claiming “Facebook-like” features and functionality for the enterprise. By the way, we’re once again conducting the Intranet 2.0 Global Survey 2010 to learn the latest about what social media organizations are using, not using, and the reasons for their use/disuse. As I have tried to illustrate within this article, there are numerous tools in the Intranet 2.0 space, and many of them do a great job. However, unless you know what your organization really needs and is able to adopt, you run the risk of alienating your employees. What is required is a solid understanding of your user needs and a strategic plan to get there. It must definitively illustrate how you are either going to make the CEO money or save the CEO money.